EQUUS SERIES 2009, gouache on archival digital print/Hahnemühle, 15 x 8 inches each. 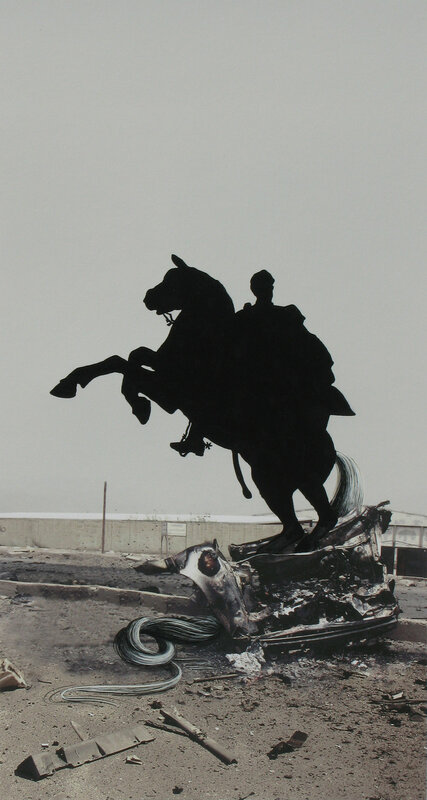 In the EQUUS series, mangled machinery — the aftermath of VBIED’s (Vehicle Born Improvised Explosive Devices)— serve as pedestals for painted silhouettes of equestrian statues. Lands from Iraq to Afghanistan are linked by the continuous horizon behind these steeds while the identities of their riders vary from nationalist liberators to clerical commanders to conquering emperors. Whether villains or good guys, they represent those who use violence as means to an end. The easy reverence they elicit as monuments belies the empty heroism that history sometimes exposes but more often forgets. Emerging from the black voids of the silhouettes, horses’ tails come to life as sensuous appendages that are impossibly long and knotted. They get trampled by their own bravado, and caught in the machinery. Alexander III created one of the largest empires in ancient history, conquering the Persians and spreading Greek culture to the east. He became the measure against which generals, even to this day, compare themselves, and his tactical exploits are still taught in military academies throughout the world. Sources: From photos from The War in Iraq by David Leeson, SPC Ben Ballard, Columbus Ledger and Romeo Gacad with silhouette of King Frederik V in bronze by Jacques-Francois-Joseph Saly in front of Amalienborg Palace, Copenhagen. Frederik V founded the Royal Danish Academy of Art and purchased the Danish West Indies in 1754. His last words were reportedly: "It is a great consolation to me in my last hour that I have never willfully offended anyone and that there is not a drop of blood on my hands." Sources: Iraq Car Bomb http://www.troopsneedyou.com/press.php with silhouette of the 1902 statue of Bishop Absalon in Copenhagen. Bishop Absalon founded the city of Copenhagen. His bronze statue, erected in 1902, was created by sculptor Vilhelm Bissen (1836-1913). The plinth is made of granite, with an engraved belt praising Absalon as a mighty brave warrior. 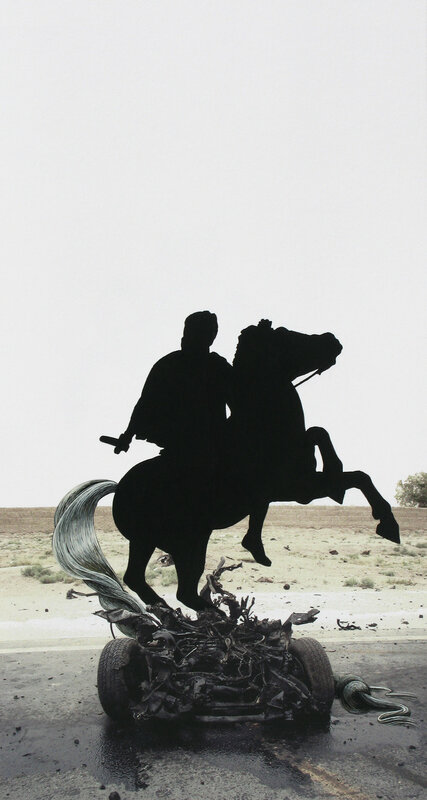 Sources: pmcleary with silhouette of Juan de Onate by John Houser. Juan de Onate was the colonial governor of Mexico and founder of settlements in the southwest USA. In a conflict with the Acoma tribe, his soldiers killed 800 villagers. They enslaved the remaining 500 women and children, and by Don Juan’s decree, amputated the left foot of every Acoma man over the age of twenty-five. Eighty men had their left foot amputated. Sources: Iraq Car Bomb http://www.troopsneedyou.com/press.phpwith silhouette of Simón Bolívar in the Unted Nations Plaza of San Francisco. Bolívar, aka The Liberator, contributed decisively to the independence of the present-day countries of Venezuela, Colombia, Ecuador, Panama and Peru where he is revered as a national hero.